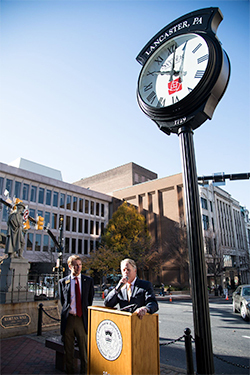 On November 18, 2016 Chip & Chad Snyder donate the new Penn Square Clock to the City of Lancaster. 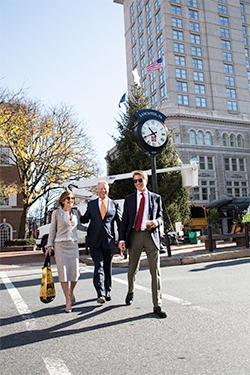 Our beautiful city has always been symbolically referred to as the “Red Rose City.” When I was working on the design of the clock for Lancaster City’s Penn Square with City Planner, Charlotte Katzenmoyer, we really wanted to incorporate the Red Rose. The Red Rose represents a few things to all of us: love and passion – we’re very proud of our Lancaster, the history and innovation of the City, and are passionate for the well-being of our city; the rose is also a symbol of great respect – our city is known to welcome all ethnic and cultural backgrounds with open arms; and courage – Lancaster has embraced many courageous people who have helped transform our city into what it is today. As a little boy growing up in Lancaster City, on King St., I can remember walking through Penn Square on my way to the annual Christmas Tree Lighting at Central Market with my sister, Christina, and parents, Chip and Doreen, and watching Santa at Watt &amp; Shand; I never imagined I would be standing on Penn Square, 30 years later, dedicating a clock to the city we all admire. Our family is very honored to be able to present this clock. 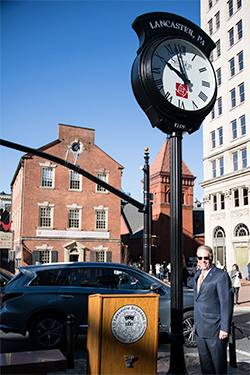 After hearing that the former clock was being removed with no plan to replace it, I presented our idea to Charlotte Katzenmoyer and Mayor Gray. Our family agreed that this was a fitting tribute to the city that will honor our families’ long history of service and civic engagement. My grandfather, Charles F. Snyder, founded the funeral home on King Street in 1947, and served as the City Controller from 1962-1966. My other grandfather, George Vlassis, was employed by the City as a housing inspector, and my great aunt, Janice Stork, was Lancaster city’s first female Mayor who served two terms from 1990-1998 – all were city residents. As a newlywed, my wife, Lee Shand and her family, owned and operated the Watt &amp; Shand Department Stores for over a 100 years at Penn Square. 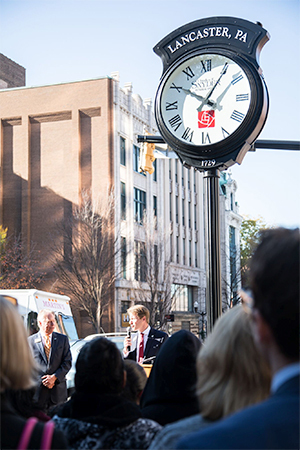 On behalf of our entire family and staff, we would like to dedicate this clock to the City of Lancaster as a monument for all of the hard work and all of the time that has been spent in making this the best place to live in the United States! Charles F. “Chip” Snyder, Jr.